Day Two of my little October vacation. Liam asked to be picked up from school so he can bring home a sousaphone to practice for auditions next week. But my hope is to be far away by two o’clock. Thinking Nerstrand or Frontenac. From the blog: We drove to Little Falls yesterday. Dorothea’s aunt celebrated her eightieh birthday at the Senior Center. I was reminded of both my mom’s eightieth and her ninetieth, of who was and wan’t there for each, what they looked like, and how their appearance changed over the decade. 80: my mom was driving and just moved to a townhouse-sort of place. Did things like drive to the farm and Little Falls. 90: stopped driving, and moved into an assisted living facility attached to a nursing home. 80: there were in attendance some still lively cousins of hers and other weird relations; 90: not. One (at least one) cool thing about Dorothea’s side is that they’ve maintained contact with the side of the family that stayed in Germany. There was a brother who stayed, and a brother who left. Also, Dorothea fell in love with and spent most of the time sitting next to this guy who looked like and sounded like her father. 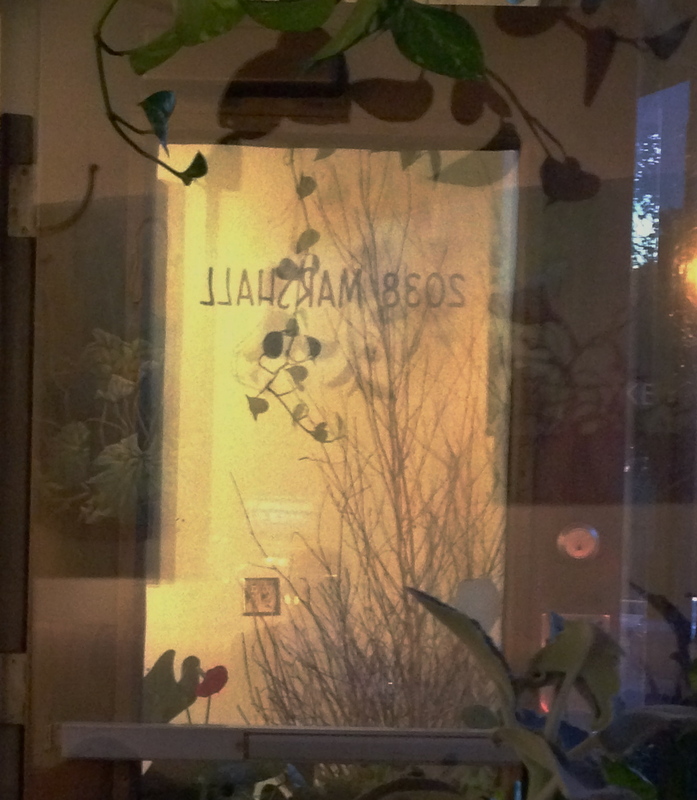 From my blog: I saw this first picture and fell in love with it. (Is now my background.) 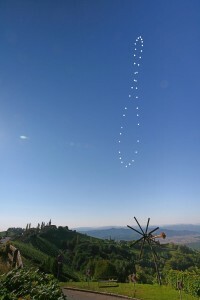 Then saw this second analemma–not in love, but curiosity satisfied from first “where’s the other half?” From Astronomy Picture of the Day website. From near Kitzeck im Sausal, Austria. Driving west yesterday 6:43 PM, what first looks like dust blowing off the roof of the car ahead of me in traffic, in winter you’ll see that with snow being blown off, but then realized: windshield wiper fluid. Sparkle in level direct straight ahead sun. Just before I’d noted my own windshield was not perfect. Then I saw another plume from another car. Spouting. A pod. 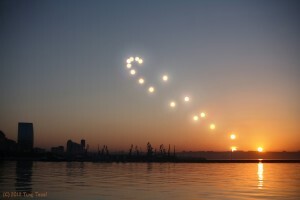 Checking the newspaper this morning, it said sun is now riding/setting directly east-west, causing problems for drivers. And remembered the magical morning light the day before walking Selby after breakfast. Then and only then did it come to mind: Equinox. DFL booth. Barak and me. 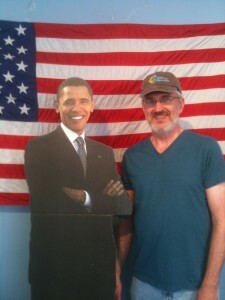 Forgot to go to the Republicans and get my picture with Ronnie. Literally just hailed them and asked if I could take their picture. 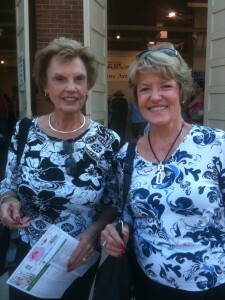 Dorothea and I chatted with them. Of course, they both took off their glasses. Didn’t notice til later. They’re in town from Missouri for a wedding. 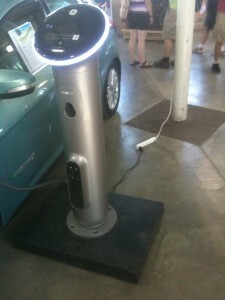 Ford’s new all-electric Focus. $40,000. 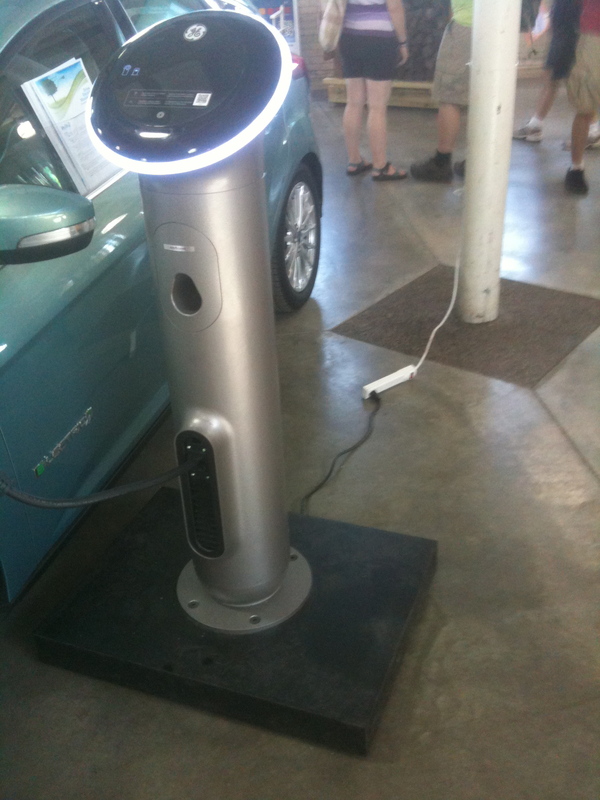 Love the way it’s plugged in via a power strip. Which is plugged into a nuclear reactor. Or a coal-fired power plant. If you ride your bike to the fair, you can park it for free. 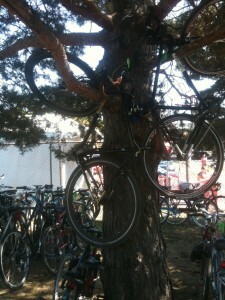 They must’ve run out of rack space, ’cause there were bikes hanging in the trees.